Hello everyone. Thanks again to all of you who gave me ideas on titles for my new book, exploring the challenges of shared decision-making between doctors and patients. The book is officially on sale now, so I thought it would let you know who won the book titling contest. I loved a bunch of your ideas, and forwarded about a dozen of them to my publisher. I loved Johnny Hill’s suggestion: Men Are from Mars, Women Are from Venus, and Doctors Are from Saturn. But I have always been partial to Pluto! A responder named Terry suggested a great title: “Trust Me, We’re a Doctor.” That title does a great job of capturing the spirit of shared decision-making, which runs throughout my book. 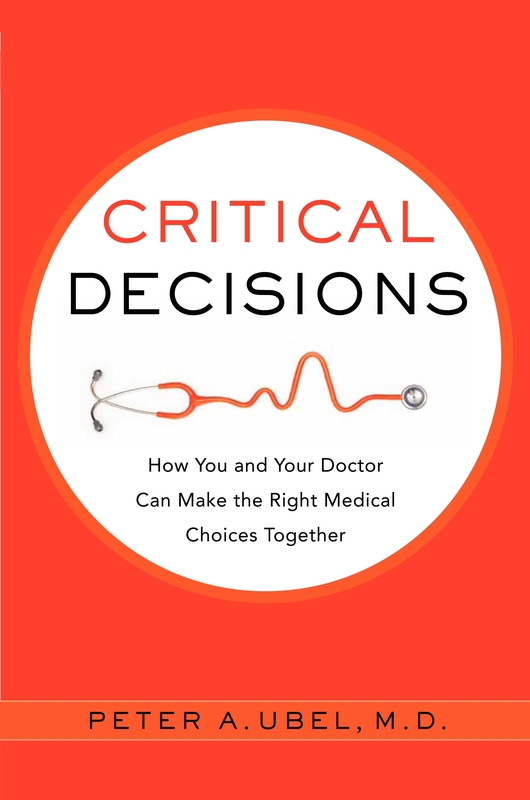 But the winner is Jessica Margolin, who suggested a title which came very close to the one my publisher chose: Critical Decisions: How You and Your Doctor Can Make the Right Medical Choices Together. I am totally excited about this book. It explores ideas I have been working on for over 15 years. In it, I tell stories from both ends of the stethoscope — stories of physicians and patients struggling to make tough choices together. There is a lot of of irrationality at play in these decisions too, sometimes exhibiting itself in ways you don’t see outside of medical encounters. Read the book and you will not only understand your own thinking better—and gain insight into how you are likely to respond if or when you have a difficult decision to make—but you’ll understand your doctor better too! You can find more info on my website, including video previews of book chapters. Or just get the book, read it, and let your friends know what you think.